In late July, BikerBuck and his pal John flew from Campbell River B.C. across Vancouver Island to Kyuquot Beach House for some classic West Coast fishing. 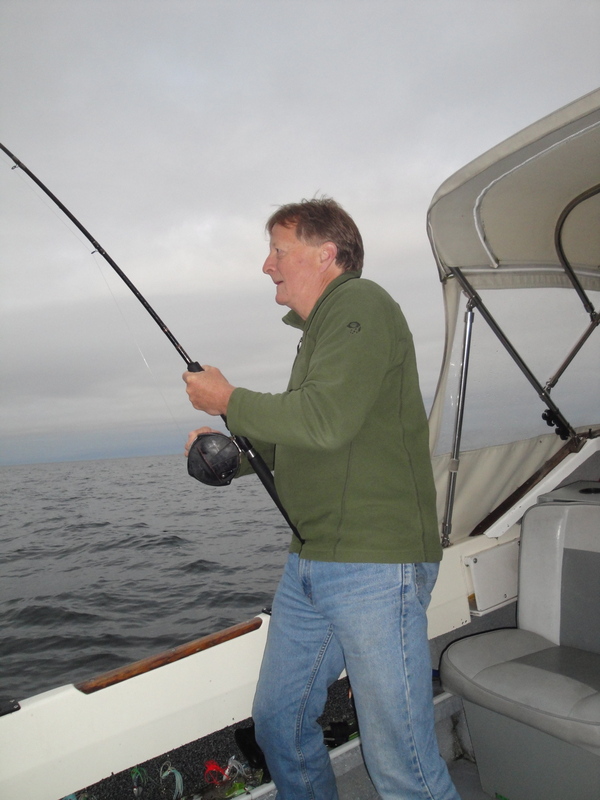 John Frishholz is a long time Quadra Island resident and an avid fisherman. He introduced BB to salmon fishing in B.C. 22 years ago and is a regular annual guest at Mike and Lynn Barker's Kyuquot Beach House on the wild and wonderful west coast of Vancouver Island, just south of the Brooks Peninsula. This year was BB's fourth visit to Kyuquot with John. We spent two days apiece aboard First Nations guides Archie and Wayne (above) Vincent's comfortable and speedy boats. The weather was chilly and mild, sea conditions nearly perfect for our 6 to 12-hour days afloat. 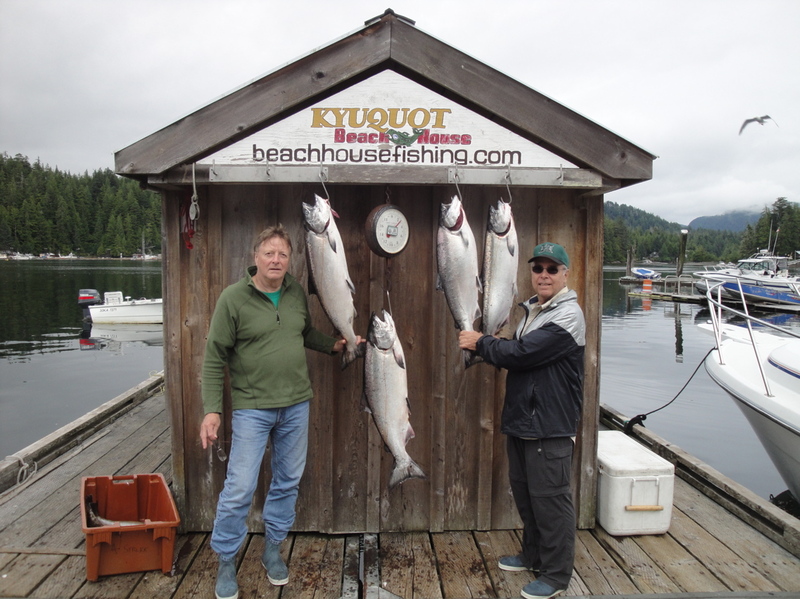 Spring Salmon - AKA Chinooks - are the sportiest and most popular catch. Each angler is limited to 2 per day, 4 in possession. John and I limited out with eight Springs, averaging about 20 lbs. each. Halibut is the other big prize. The limit is two small (under 12 lbs. or so) and two large (big as you can land.) 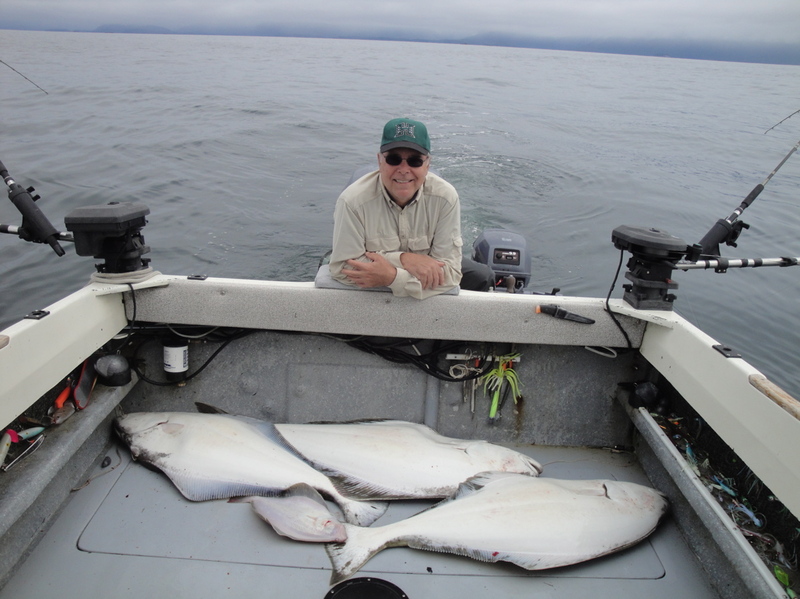 Again we limited out with a total of about 160 pounds of Hali. The smallest fish you see here is a sole. First time we got one. 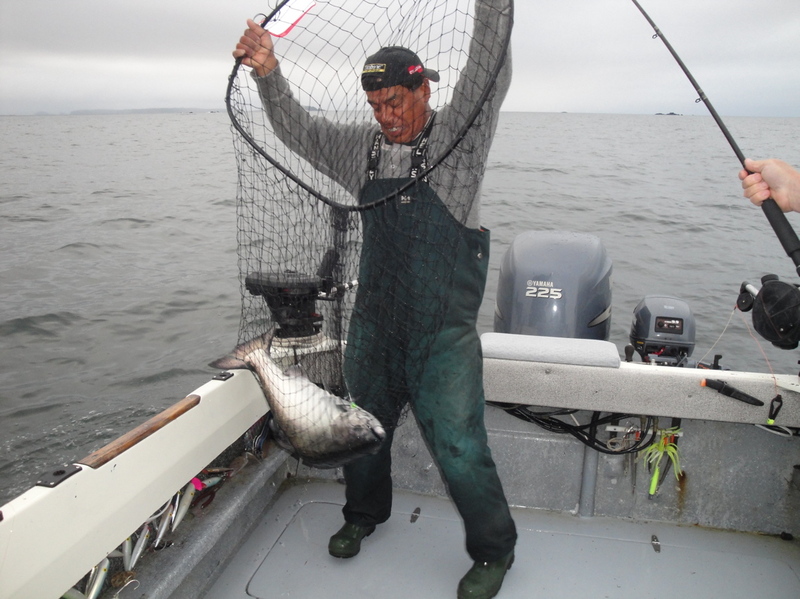 We also caught well over a dozen Coho salmon, only 2 of which were hatchery-raised keepers. We released all of the wild ones. Now here's something you don't see every day. I mentioned the flight to Kyuquot from Campbell River...it's a thrilling 50 minute ride in a DHC-3 Otter that features a spirited climb to 6,100 feet, threading between 7,000 peaks that look close enough to touch, and a delicate landing in shallow water tucked nicely beneath a 500 foot ceiling of thick clouds. Obviously we made it in safely. Four days later the Otter arrived with a new load of 10 anglers and lots of gear in the same plane that we would be departing in after lunch. Except....while taxiing in to the lodge the pilot ran over a buoy that he could not see due to the blind spot beneath the engine cowling and pontoon struts. Wham! Propellor blade tips all perfectly bent, resembling snow skis. 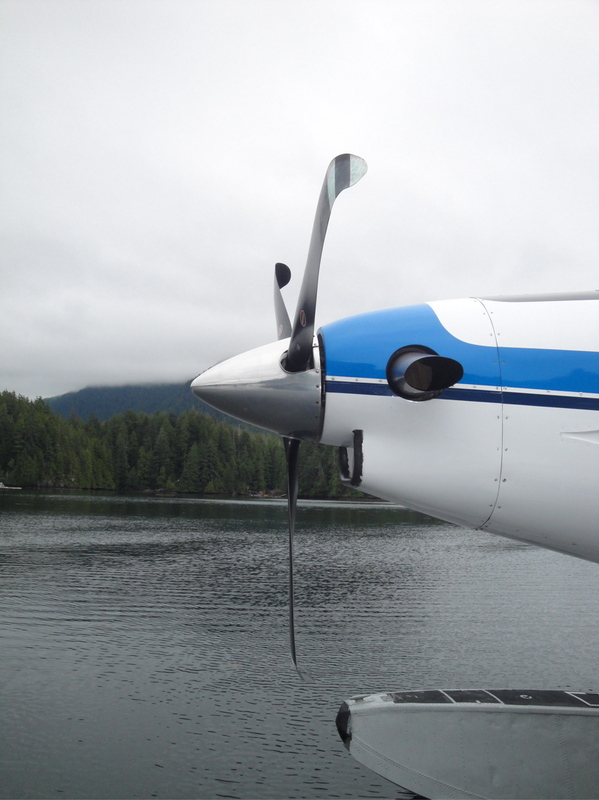 Our hosts quickly ordered up a replacement plane and we returned safely to Campbell River about an hour late. As BB writes this entry, 5 days after the incident, the plane is still docked at the Beach House awaiting not just a new prop, but also the inevitable inspection of the turbo engine which would have been severely shocked by the collision. As the old Navy saying goes, "a collision at sea can ruin your whole day." Fortunately there were no injuries.